[By Richard Sheppard in Napa Valley, California] It’s not every day I get to meet a world famous winemaker, but through my friend Kristina King, I was lucky enough to discuss wine production and storage with Bo Barrett of Chateau Montelena in Napa Country California. Even though there was plenty of wine, sketching, of course, was my primary reason for visiting. After driving the familiar Route 128 to Calistoga, and a left on Tubbs Lane, I pass Envy Wines where Vince Tofanelli bottled his zinfandel a few weeks ago. Up ahead, the sign for Chateau Montelena appears, and I park beside a thicket of eucalyptus trees. The view across the estate is reminiscent of Monet’s Giverny garden paintings — pink peonies, blue columbine and wild grasses flourish along the banks of a lake, a pair of black swans gliding effortlessly on its surface. 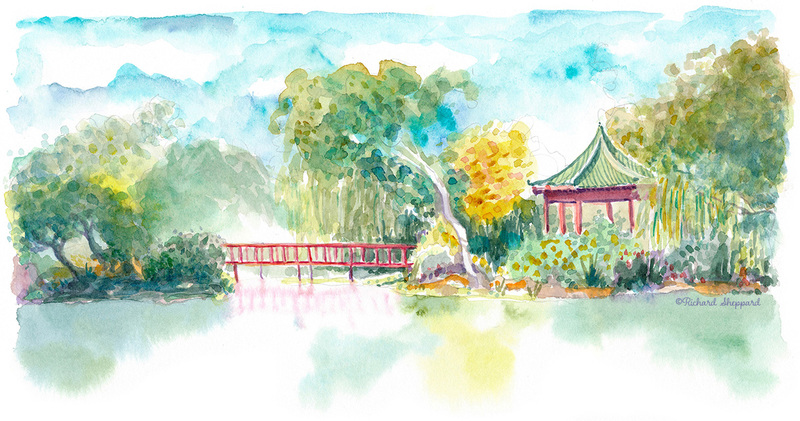 Two Chinese pagodas nestle between weeping willows, each with its own separate island and zig-zagging bridge. Sunlight filters through leaves, lighting up the gray stone manor, its two turrets rising high above the landscape. Up the staircase is a courtyard where the building’s facade is fully visible, a castle covered in vines. 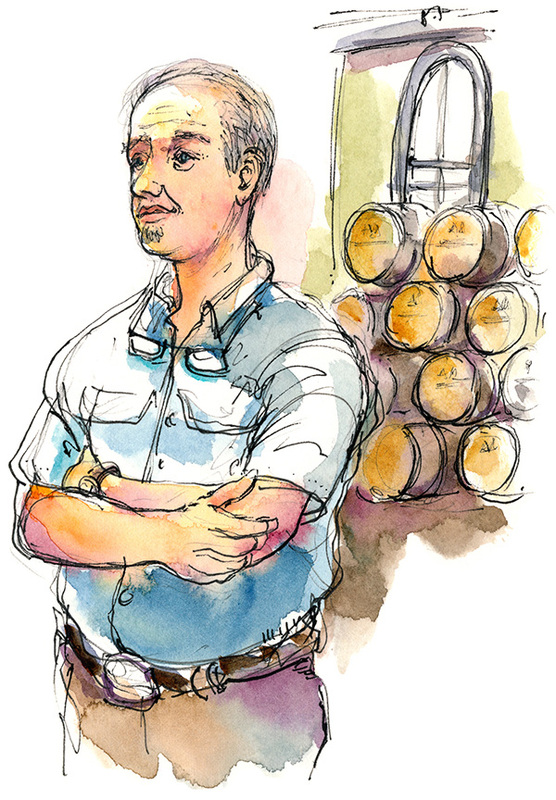 As he talks with a cellar worker, Barrett is easy to spot there, a distinguished man with white hair and soul patch goatee that gives him a rebel flair. “Let’s head over to the cellar,” he tells me. As we enter the stone building and walk through a lab and into the tank and barrel room, I tell him how I worked the 1990 harvest at Robert Mondavi’s cellar, doing pump-overs and punchdowns. Back then we used air pumps on Robert’s prized Reserve Pinot, since they were thought to be more gentle on the wine. Some winemakers take the most gentle approach of all, using gravity to rack the wines by placing one tank above another. The entrance to the wine caves lies at the back of the cellar. The dampness inside smells of earth and oak, adding a palpable air of mystery. We follow the narrow passageway lined with barrels until the cave forks in three directions, each disappearing into utter darkness. With a flick of a switch, Barrett lights up one of the corridors and leads us through yet another portion of the maze. 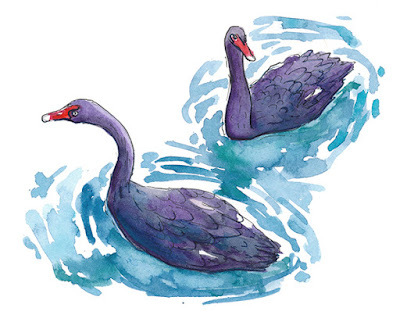 At the end of a passageway, we reach two tall, arched doors. 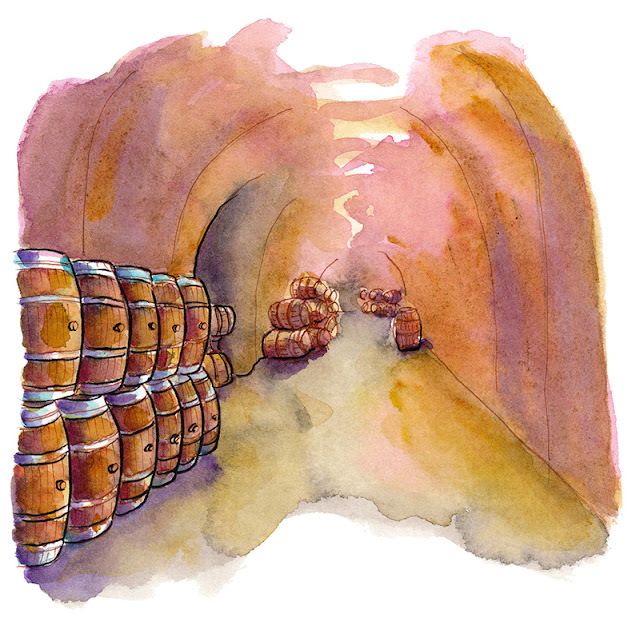 Inside, several rows of wine barrels are stacked two wide and four high, receding into the distance. Liquid gold. This is where the wine finishes its aging process? Looping back through the caves, we exit the cellar for the courtyard, where Bo’s pick-up truck awaits. 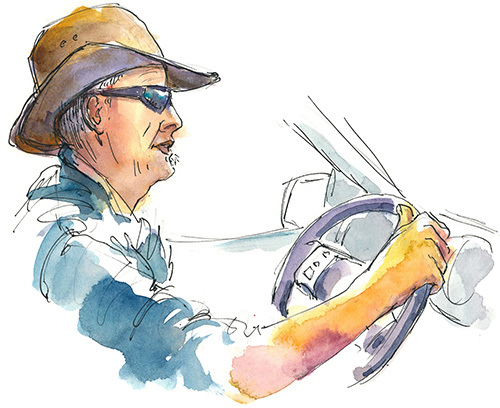 At the far end of the estate, Bo pulls off the dirt road, into the shade of a giant oak. Barrett’s vineyards are naturally low yielding because of their rocky soil types, but dry farming also helps keep the yield low, as does annual crop thinning. To ensure even ripening, his crews also monitor the canopy of vines that grow up around each plant, periodically removing leaves to help sun reach the grapes. There’s that word terroir again. It keeps coming up, but I believe I’m getting it. The flavor of the grapes is influenced by the type of soil, weather and amount of water they receive. In other words, the same Cabernet grape grown in any other region of the world will produce a different wine. Then there’s a human element that affects the quality of the wine, and the importance of storing the finished wine at just the right temperature and humidity to bring out the best possible flavors of an aged wine. Vineyard manager Dave Vella pulls up beside us, interrupting our conversation, and the two men start talking shop. “Perfect,” I say. All this wine talk is making me thirsty. 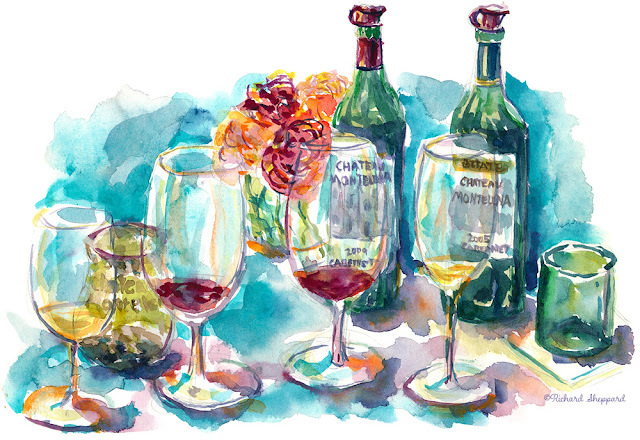 I return to Chateau Montelena several times over the next couple weeks to sketch the cellar, vineyards, and stone chateau. 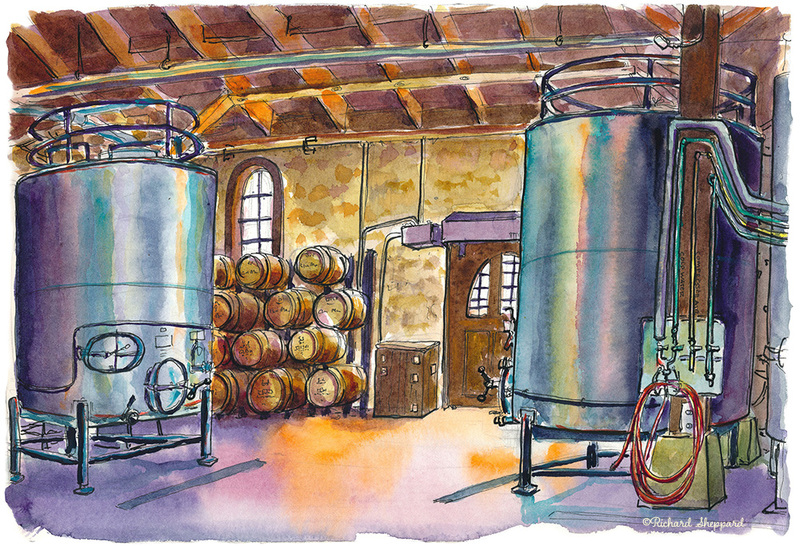 As my painting time at the estate accumulates, I feel like a resident sketch artist documenting the winery’s past. What a pleasure to feel so comfortable in such a singular place, so key in the history of California wine.